Following the runaway success of recent super-zoom cameras, Kodak are hoping to take a slice of the action with the introduction of the Easyshare Z990 "Max". Complete with a Schneider Kreuznach 30x zoom lens, 12 megapixel CMOS sensor, full manual controls with histogram and 3 inch LCD screen, the Z990 looks to be all the camera that a keen photographer would need if a DSLR isn't a viable option. Designed like a DSLR, the Kodak sports a large grip and command dial but also throws in elements of being a compact camera such as the zoom rocker around the shutter release button and the direct record for the HD video. 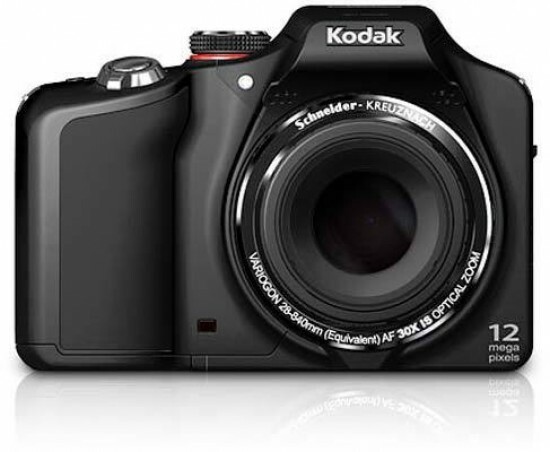 The Kodak Z990 retails for £299 / $329.95. When Kodak introduced the Easyshare system in 2001, the idea was that everyone (probably in the world) should get a Kodak, then the cameras would be loaded onto any Kodak Easyshare dock so that pictures could be seen and adored by anyone. Things don't always work out as planned and although Kodak retain the fundamental elements of the sharing system, the way they go about it has changed. The dock is now out and there's a three step technique. When you're viewing the pictures on the rear screen, press the Share button, choose the way you'd like to share the picture from email or Kodak digital picture frame and connect the camera to the computer. The camera will automatically upload your pictures to your desired location. With this simple structure to sharing pictures, it would be nice to see Kodak take a similar approach to the rest of the menu system, but that's not the case. There's no strict menu which is something that everyone is used to. All the settings are on display on the screen and they're accessed from here with the exception of the Settings menu which has a new area to go into. The main problem is that the screen on the back looks quite cluttered. The Kodak has an electronic viewfinder which switches on if you press the EVF/LCD button on the back but this is quite dark, although it's better than trying to use the screen in very bright sunlight. Kodak have opted for a BSI CMOS sensor with the Z990 camera. BSI stands for Back Side Illuminated and has nothing to do with the derriere. On a standard sensor, pixels are surrounded by circuitry which transfer the information that the pixels collects through the processor and stores them on the memory card. The circuitry hides a portion of the pixel making it less responsive to light. ISO then needs to be increased to work in low light situations. On a BSI sensor, the circuitry is placed on the back of the sensor meaning the entire pixel is exposed. This means a lower ISO can be used and noise is reduced. The name comes from when looking at the sensor, as it looks like it's been fitted in reverse because the circuits are at the back. This is Kodak's first BSI sensor so our noise tests are of particular interest. The BSI sensor also allows for a new HDR feature which creates a HDR image in the traditional way. Some cameras have an intelligent contrast feature to cap burn out and boost detail in shadows. Nikon call it D-Lighting and Canon call it iContrast. Most companies have one now but Kodak seem to have gone down the other route. The camera physically takes three pictures in succession before merging them into one. It takes a while to process the information which is something that we instantly had issues with. Pictures take longer to process on the Kodak, especially in RAW mode, while video seemed to take an age. We missed a few opportunities because the camera was busy downloading information. Designed to reflect a DSLR with its large grip and command dial sporting manual commands such as aperture and shutter priority, the Kodak Z990 has a large 30x optical zoom which stretches from a wide-angle view of 28mm to an eye-watering 840mm. This kind of range is great for really distant subjects such as ships at sea or people on cliff-sides. It also means that you don't have to walk as far. An optical image stabiliser is fitted to the Z990 to prevent shake, but we found that even in bright sunlight, if we were on a low ISO, we had to have the aperture wide open to prevent camera shake and even then we still got it. We also think Kodak have missed a trick with the zoom. It's operated using the rocker switch that wraps around the shutter release button. The lens barrel has a huge expanse of space that does nothing. Converting this to a zoom ring would have allowed for smoother zooming, no stepping and would have been more responsive. The zoom isn't very responsive at all as it happens. We were sometimes stood frantically flapping the rocker while nothing happened for what seemed like minutes. In reality it was only a few seconds but in photography, every second can count. The Z990 feels solid and positive with all the controls falling at fingers or thumbs. Buttons are easy to press and the command dial doesn't stick. The camera takes 4x AA batteries which are included in the box along with a charger. It's a nice touch because usually there's just a set of one-use batteries in the box. After a full charge, the batteries lasted us through a full day out at an event with the camera being switched on and off constantly as well as reviewing pictures. That evening, the camera read the batteries as half full which is pretty good. One disappointing area to see is the lack of a metal tripod bush. With a camera such as this, it could become a part of the camera that sees a lot of use and will wear down quicker. Playback is certainly entertaining if nothing else in the Kodak Z990. The dedicated button is located towards the bottom of the camera on the back. It brings up a small menu of how you'd like to locate pictures. You can either view all of them, search by all, people, date, keywords or videos. The people section is for the face recognition system that the camera has. It allows you to name people that the camera will search out in a picture and give priority to them in a picture. If you've not set this up, you'll see a grey box. Interestingly, if you have a video as the preview, you can't zoom out to see the smaller thumbnails. To do this function, you must have a still image on the screen. After doing this, videos can still be seen though. In a similar vein to what Fujifilm have done with the FS range, Kodak have installed simulations of their popular films onto the camera. The films available are; Kodachrome, Kodacolor, Ektachrome, Tri-X, and T-Max. Sepia is also available in this mode. Another interesting feature that the Kodak Z990 has is the Photobooth mode. It takes four successive images and stacks them like an old passport booth would do (these days they're generally in a square). The pictures are self timed and you get a beep counting down. Out of all the Kodak digital compact cameras we've tested, the Z990 appears to be the most feature laden, intuitive and clued-up camera of them all. It's bursting with features, has upgrades on top of upgrades and generally feels pretty good. Kodak seem to have gone to town on the Z990 Max and maybe that's where the name comes from. All the stand-out features in the world will amount to nothing if the camera can't take a good picture, so let's take a look at its image quality next.